The world premiere had been due to take place at the beautiful church St Bartholomew-the-Great on that fateful day of the London bombings 7th July, 2005 as part of the City of London Festival. First and foremost one’s heart goes out to all those grievously affected that day, with a feeling of solidarity and thankfulness for the many who swept into action to try and help those killed or injured. I recall vividly our last rehearsal on the 6th July, just after midday. We had been working on the piece over the previous month and had finished our final run through. Nerves were jangling but not with fear. There was such excitement at the prospect of being the first people to introduce this new work to the world and just as we finished the 3rd movement there was a deafening roar. It was the sound of the flyover that celebrated London being awarded the 2012 Olympics! The following day, of course, held disbelief at events as they unfolded. There was no question about having to postpone the concert, but we then had to decide when to give the postponed premiere. The only date anywhere near that time that the church was free – and didn’t clash with the BBC Proms – was the following Sunday. The Rector of the church kindly cancelled evensong and allowed the concert to take place instead. London was still in a state of shock and having gone from two back to back sell out performances, attended by all the major newspapers, we found ourselves with no reviewers at all and only one performance. To say it was a crushing blow to us and to Joby is a colossal understatement. First of all we only had 12 of the 17 singers available for the day so we had to draft in five new singers who had not been involved in any rehearsals so were effectively sight reading it – not advisable – and, of course, these singers couldn’t be expected to sing any of it from memory so most of the movement that we had worked out was not possible. 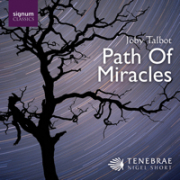 However, the singers did a fantastic job and subsequently we did manage to perform the piece with all the various sound and stage effects that Joby had envisaged, although we have not yet performed the entire work from memory. That will hopefully happen in 2017 when we plan to celebrate Tenebrae’s 15th anniversary with lots of performances of the work in as many far flung corners of the globe as we can organise! We hope to see you there. ← A month of King’s Singers encounters!